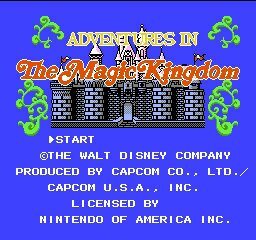 All games in tagged with "Adventures in the Magic Kingdom"
Adventures in the Magic Kingdom is a video game released in 1990 for the Nintendo Entertainment System. Its soundtrack was composed by Yoko Shimomura who later scored the Kingdom Hearts series. The game places you as a nameless main character. Goofy left the golden key for the castle gate inside, and Mickey Mouse asks for the player's help to find six silver keys needed to open the Cinderella Castle gate and allow the Disney parade to begin. After completing this task, Mickey congratulates the player and the parade begins. Although the cover art and title suggest that the game is intended to depict the Magic Kingdom in Walt Disney World, the location of attractions within the in-game overworld map suggests a layout more akin to Disneyland in Anaheim, California.